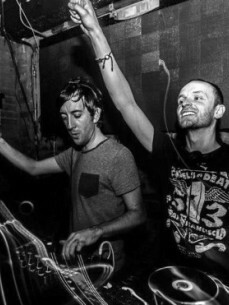 Audiowhores is the acclaimed and world renowned UK house music duo of Graham Lord and Adam Unsworth. Their high-quality original production and remix work for labels including Defected, Toolroom, Noir and Lapsus has positioned them at the forefront of the UK's house scene. Similarly, their versatile DJ sets which incorporate everything from deep and soulful sounds to tougher and techier beats, have won the pair fans worldwide. Audiowhores was ‘born’ in 2000 when Graham and Adam met at legendary UK club ‘Out In The Sticks’ - sharing a passion for the sounds of Dave Lee, Knee Deep, Masters At Work, Full Intention and Jazz 'n' Groove, Adam and Graham resolved to work together. Adam already had a solid seven years experience behind the decks and was enjoying various residencies - Graham meanwhile was producing his own tracks and held a wealth of musical knowledge and expertise. The guys haven’t looked back and have gone on to build up a prolific portfolio of original productions and remixes earning them global recognition and respect as a top UK house music duo. It was back in 2012 when the boys got their 1st Beatport top 5 with ‘Sometimes’ which was also Traxsource’s #1 downloaded track of the year. Recently the boys have been hot property on Traxsource & Beatport, having racked up six #1 hits on Traxsource in the space of 18 months. 2014 has certainly seen them propel to greater heights with their single “Facts’ featuring Stee Downes which went top 5 on Beatport and enjoyed regular airplay on Pete Tong’s BBC Radio 1 show. The list of artists remixed by Audiowhores reads like ‘who’s who’ of house including Barbara Tucker, Kathy Brown, Julie McKnight, Hardsoul, The Sunburst Band, Ce Ce Peniston, Loletta Holloway, The Shapeshifters, Imaani & Roland Clark. Meanwhile, their original productions have seen them team up Haze, Stee Downes, Roland Clark, Pete Simpson, Groove Assasin, Alex Mills, Nica Brookes, Rashaan Houston, Radhika, Alexis Hall and more recently Ann Saunderson, Zeke Manyika and Dyanna Fearon. Audiowhores maintain a busy international DJ schedule spanning the world! Aside from bringing the house down on the international circuit, they also grace some of the finest clubs in the UK. With their head down in the studio working on up-coming projects and bookings across the globe, the boys have never been busier!